Delicious food and a variety of services are provided for every event. Popular menu selections will be prepared on premise by our executive chef. You and your guests will enjoy a customized menu chosen by you - just for you! Buffet options include tea, lemonade, water and coffee. Additional soda packages as well as professional bar services can be added for an additional cost. 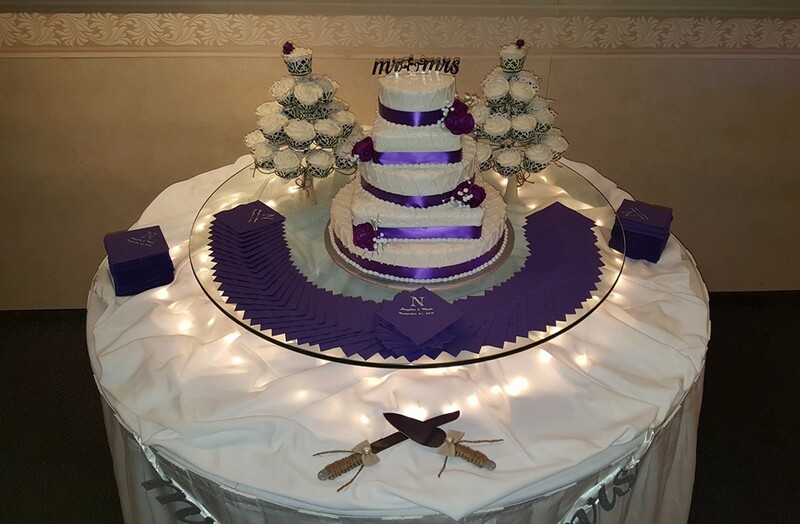 Your beautiful wedding cake or specialty dessert will be cut and served to your guests by our wait staff. Your top cake will be wrapped for freezing, so that you can enjoy it on your first anniversary. Choosing the entertainment for your event is very exciting. There are many choices available and you are free to make your own selection. The entertainment for your event is one of the most critical components and we recommend booking a DJ, group, or other entertainment choice early to ensure they are available for your event date. Appropriate decorations are provided throughout the facility. The remaining guest tables can be furnished with a variety of beautiful options. Glass cylinders, mirrors, colored gems, candle holders and many other decorations are available at no additional charge. Candles are to be provided by the client. Additional decor such as table runners are also available at a nominal charge. Napkins are available in a variety of colors for seated functions. Table coverings are automatically white, and tables that require skirting (cake, gift, book, etc) are also skirted in white. 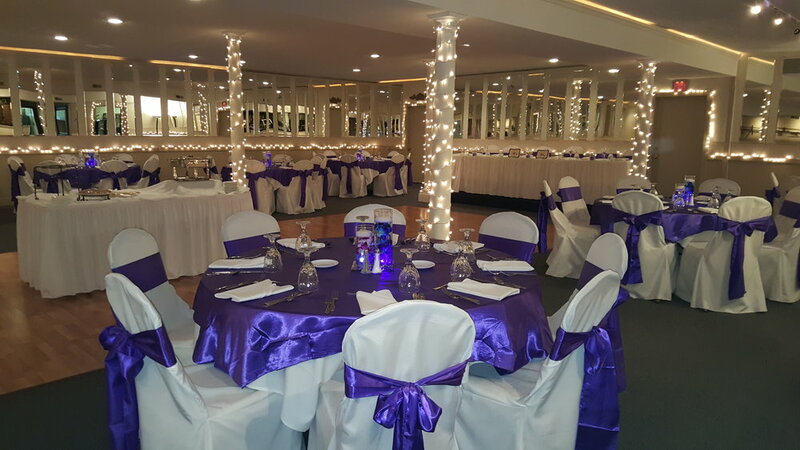 Additional decorations, such as seat covers, chair sashes, colored table linens, multiple layered linens, etc. are available for a nominal charge. With extensive menu options, there is something that will fit every taste and budget. From buffet selections to hors d'oeuvres, entrees and desserts, come sit down with us today to see what we can do for you. Let us take the hard work out of planning, so you can enjoy your special event. Catering must be provided by the Hall if choosing to reserve Centennial or Starlight rooms. If reserving Centennial 2, our smallest room option, there is the option of providing your own catering or having us cater your special day. Centennial Hall offers a complete bar for each of the three banquet rooms with many options from which to choose. Your event planner will assist you as you select the perfect beverage package for your guests. Professional bartenders will be scheduled for your event. One bartender will be scheduled for 100 guests or less with the fee of $125. If more than one bartender is needed, the price is $95.00 per bartender. There is a service charge of 18% and Michigan State sales tax of 6%. Beverages provided with buffets include: Freshly brewed regular and decaffeinated coffee, iced tea, and lemonade. Carafes of water will be placed on each table. Specialty drinks are available upon request. Bar packages include: Host Bar, Cash Bar, Three Hour Beverage Package, Four Hour Beverage Package, Beer and Wine Package, and Non-Alcoholic Package. All bars not to exceed five (5) hours. Bar may be closed during dinner service and the last half hour of the event. All bars include complimentary coffee service. Champagne, non-alcoholic champagne, a large selection of wines, exclusive beverages for toasts, spiked punch bowls, a large selection of liquor or imported and domestic kegs or bottles of beer. Don't see a package that fits what you are looking for? We customize our bar options as well. Ask your event coordinator for additional options and we would be happy to accommodate your vision. All bar services are to be provided by Centennial Hall. No outside alcohol is permitted of any kind.